A deep and ancient history, thumping nightlife, golden beaches and rugged mountains. 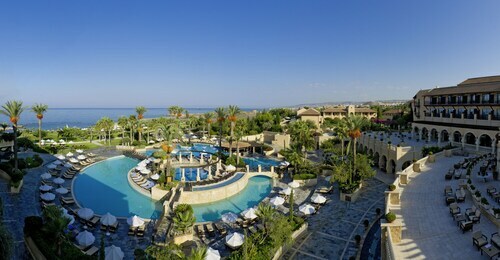 The diversity of Cyprus is difficult to match, which is probably why it appeals to such a range of travellers. Head west to Paphos and you will find an abundance of historical and archaeological sites, including the Paphos Ancient Odeon. This ancient theatre carved from limestone blocks is still used for performances of music and theatre in summertime. Elsewhere in the Paphos Archaeological Park, you can witness stunningly well-preserved mosaics at the House of Theseus, which have survived since Roman times. 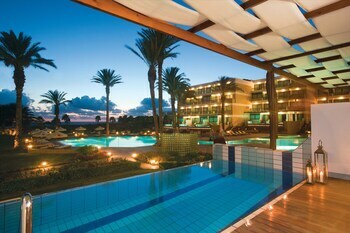 Popular resorts dot the island landscape, and one of the most famous is Ayia Napa. Here, you can head out to venues offering pumping music from dusk till dawn and see just why Cyprus has earned its party reputation. On the south coast, you'll find Limassol. Popular things to do here include visiting Limassol Castle, a medieval fortification in the old town's seafront that includes the Cyprus Medieval Museum. Head east along the waterfront and you'll discover Limassol Zoo, a family-friendly educational attraction where kids can learn about animals and birds. Just beyond the zoo is Dasoudi Beach, a stretch of coastline with a campsite, beach facilities and clean, clear waters that earned Blue Flag status. Pafos Zoo is another big draw for families. This large zoo in Paphos has all the usual suspects, including giraffes, monkeys, lions and tigers. But its claim to fame is the vast collection of parrots and venomous snakes on show. Dedicate a whole day out to a visit, planning for feeding times, animal encounters and refreshment breaks throughout the day. Venture to the southeast of the island and you can bask in the natural beauty at Cape Greco National Forest Park. If you like a spot of mystery or fantasy, you may want to search for a famous local legend, the Ayia Napa Sea Monster - a beast with six heads that's rumoured to live off the coast. Whichever of your holiday heads rears itself during your trip - culture vulture, party animal, history buff or beach bum - Cyprus is an island that has an aspect to match. 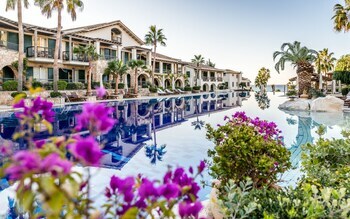 Cyprus is full to the brim with great beach destinations. 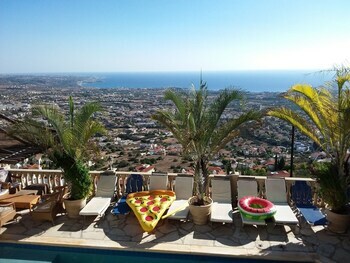 You're sure to love our cheap beach holidays to Paphos. 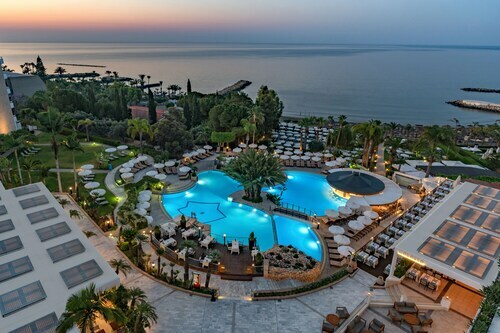 If you like Cyprus then you're sure to love Greece. 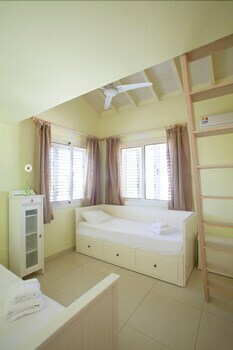 Check out our Mykonos beach holidays and other top Greek beach destinations. 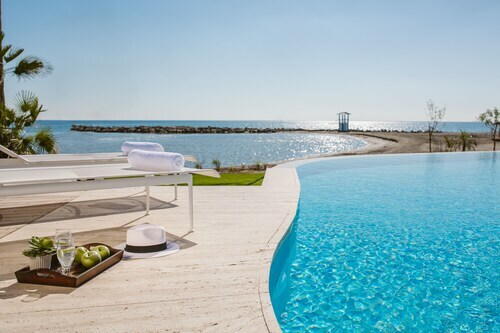 Located in Limassol, this beachfront hotel is connected to a shopping centre and within 1 mi (2 km) of Castella Beach and Amathus Beach. Amathus Ruins and Saint Anna Church are also within 2 miles (3 km). 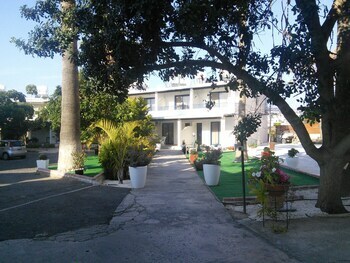 Nestled on the beach, this Oroklini hotel is 2.8 mi (4.5 km) from Theofilos Georgiadis Park and 3 mi (4.8 km) from Port of Larnaca. Finikoudes Beach and Larnaca Salt Lake are also within 6 miles (10 km). 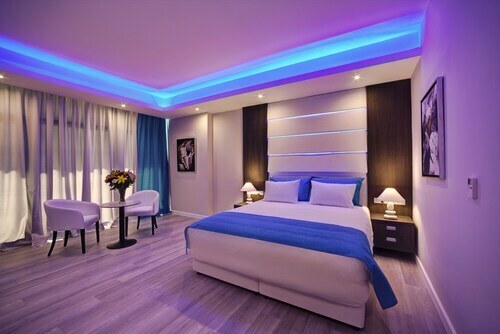 Located in Larnaca City Centre, this hotel is within a 5-minute walk of Finikoudes Promenade and Finikoudes Beach. Larnaca Salt Lake is 1.5 mi (2.4 km) away. 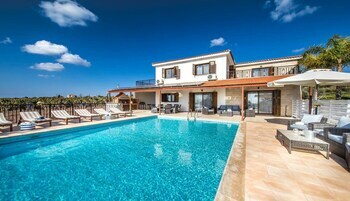 Located in Paphos, this beachfront hotel is in the city centre and within 1 mi (2 km) of Alykes Beach, Paphos Harbour and Paphos Archaeological Park. Tombs of the Kings is 2.3 mi (3.8 km) away. 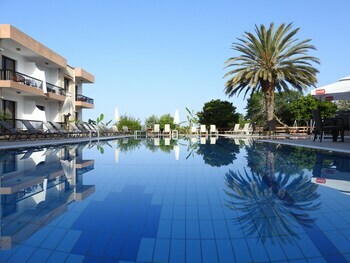 Located in Paphos, this beachfront hotel is in the historical district and within 1 mi (2 km) of Kings Avenue Mall and Tombs of the Kings. Paphos Harbour and Paphos Archaeological Park are also within 2 miles (3 km). 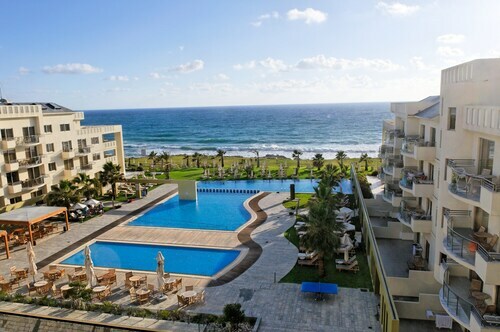 Located in Paphos, this beachfront aparthotel is next to a golf course and within 3 mi (5 km) of Tombs of the Kings, Paphos Harbour and Paphos Archaeological Park. Paphos Municipal Park and Kings Avenue Mall are also within 2 miles (3 km). 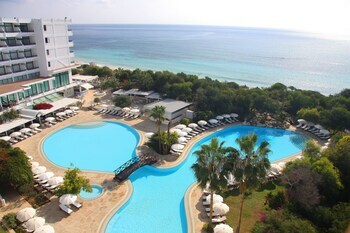 Nestled on the beach, this Limassol hotel is within 1 mi (2 km) of Castella Beach and Amathus Beach. Amathus Ruins and Saint Anna Church are also within 2 miles (3 km). 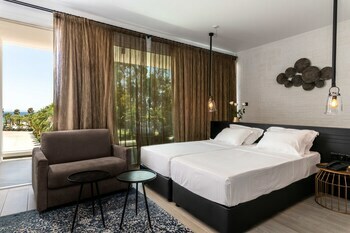 This family-friendly Paphos hotel is located on the waterfront, within a 15-minute walk of Alykes Beach, Paphos Harbour and Paphos Archaeological Park. Tombs of the Kings is 2 mi (3.2 km) away. LON-All Airports - Larnaca Intl.